A ceramic bridge is recommended for the replacement of missing teeth, or teeth that have been damaged beyond repair. Thanks to advances in modern dental techniques and material science, Dr. Sekulic will create a bridge that is designed to fit into the exact position of your missing teeth. In addition, your new teeth will be mimicking the shape, size and shade of natural teeth. Our implant placement and prosthetic restoration will be so precise that it will be difficult to tell apart your natural teeth from the artificial teeth. Replacement of missing tooth: A bridge is affixed to implant screws for support. 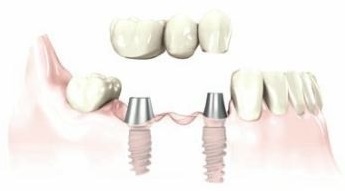 If you are missing one or more teeth implants provide a proven solution that lasts many years.